Het is een lange tijd stil geweest vanaf onze kant. Wij zijn achter de schermen namelijk druk bezig geweest met een opvolger voor MijnMaffia. Vandaag is dit ook werkelijkheid geworden: http://www.mafiacontrol.com/?tag=61a1cf0e is gelanceerd. MafiaControl stelt je in staat om een eigen maffia game te maken geschikt voor deze tijd. 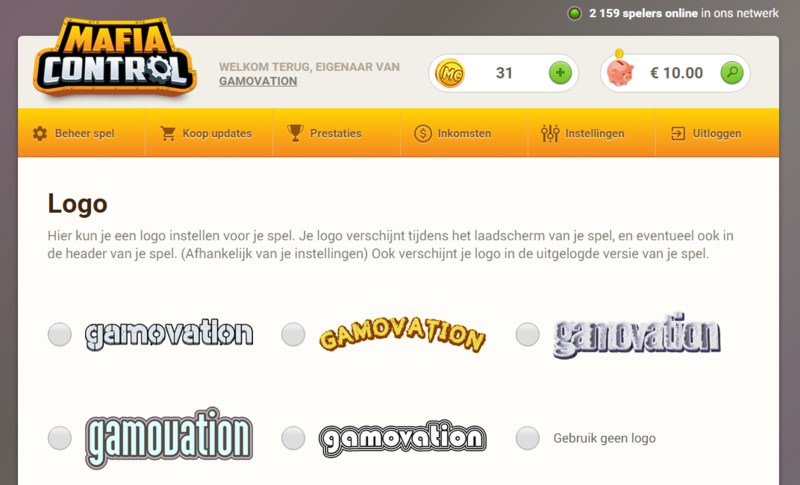 De game is veel interactiever en is naast de PC versie nu ook speelbaar op tablets en mobiele telefoons. 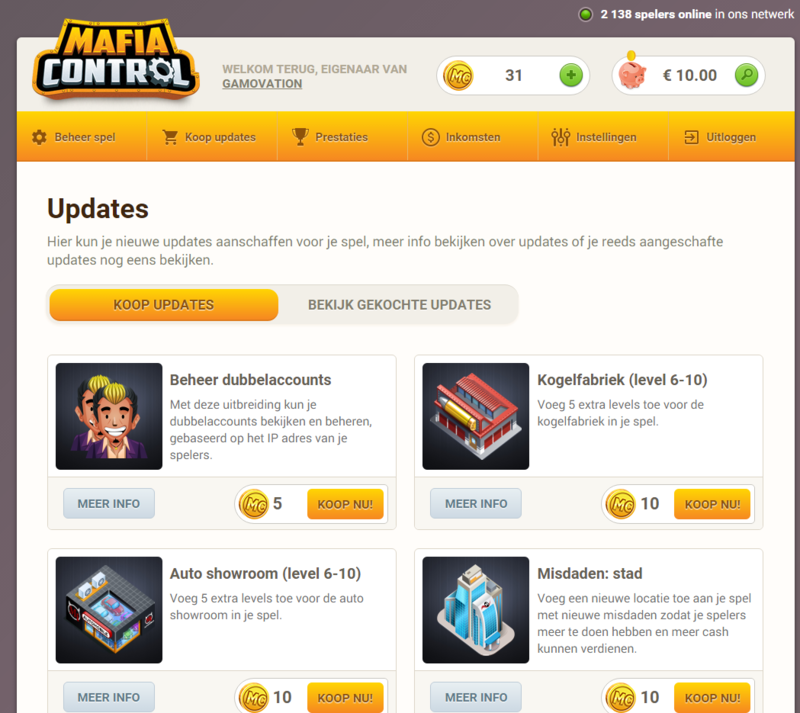 Meld je vandaag nog aan op http://www.mafiacontrol.com/?tag=61a1cf0f en krijg gratis 10 euro bonus op je account. GamoVation, the Dutch-based social game developers behind the popular fishing game FISHAO, today reveals their new venture in the form of MafiaBattle. Available on Desktop, Facebook and Mobile devices, MafiaBattle is a cross-platform MMO title that sees players attempt to rise to the top of the mafia underworld. The game will be free-to-play and is scheduled for a Q1 2015 release. In MafiaBattle, the goal is simple: become the most powerful and respected mobster in the virtual game world. To achieve this objective, you are handed your own Mafia Empire. The Mafia Empire is essentially the hub of the game, where you have several establishments – including a mansion, meth lab and hospital – that can be upgraded. When it comes to upgrading, you are rewarded with in-game benefits to further help you in your overall mission to reign supreme over competing mob bosses. An example of this includes upgrading your money press to a higher level, resulting in it producing more cash than before. Thanks to its distinctive and polished visuals, along with smooth and satisfying gameplay, MafiaBattle is positioned to become a permanent fixture among social gamers and their daily activities. ● Fully upgradable Mafia Empire: produce your own cash, ammunition and crystal meth. ● Five interactive casino games: Slot Machine, Wheel of fortune, Blackjack, Higher/Lower, and Roulette. ● From the petty to the sophisticated, perform crimes to boost your standing – but watch out for the police! ● Attack other players with the ammunition you have culminated from your Empire. Win the duel and steal all the available loot from the opposing player. ● Gain Mafia Power by buying troops. Upgrade their stats and equip them with weapons to better help you during battles. ● Start your own mafia family, or join one as you work together with other players to battle against rival families. In providing MafiaBattle with the biggest target audience that is possible, the game will be released across three platforms: Desktop, Facebook and Mobile. - Facebook: Facebook will be another platform that will be utilised, making sure that social media users have access to the game. - Mobile: With the overcrowded nature of app stores, MafiaBattle will instead be available for mobile and tablet devices as a web-app. Mobile users simply visit the MafiaBattle homepage and play the game as they would on a desktop - all functionality included.